Wudtone (Fender) American Standard upgrades are now available in our online shop here. If you have an American Standard / Deluxe guitar and you want both the dynamic and tone of a vintage bridge plus total tuning stability then read on. 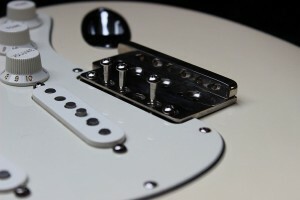 Two post trems have been fitted to Fender American Standard/Deluxe guitars since the late 80’s. When set up right, they keep tune and have a friction-less ease of use. As effective as they are, some guitarists find them too soft and chirpy, especially when playing with more attack. 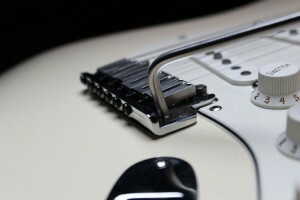 The connection with the body of the guitar is very different to that of an original style vintage plate. We think it is fair to say that many guitarists still prefer to use a vintage style bridge because of the extra dynamic and tone they get from the guitar. Fitting is easy with no specialist skills or tools required. Click here for detailed fitting instructions. Special insert/bearing screws are included for the two outer holes, which screw straight into the existing shanks. The Wudtone CP bridge is then located whilst pilot holes are drilled for the four inner screws. Set up is equally straightforward; screw the bearing screws down until they just touch the surface of the plate. The plate cannot then move up or down, but it will still tilt freely ( the design and cut of the relief’s including the recesses in the top of the plate enable this). After fitting the Wudtone upgrade the first thing you will notice is an increase in the acoustic volume of the guitar. The feel of the energy of the string vibrations through the body and neck will also be more noticeable. This is because there is now a connection to the body of the guitar across the whole of the length of the underside of the bridge. The Wudtone CP technology provides complete tuning stability, up pitch as well as down pitch. Set up with some float the Wudtone CP will be even more sensitive than a two post but it won’t feel as soft/loose, you won’t experience the same warble/chirping some guitarists experience with a two post trem. Because the guitar has more acoustic volume, it becomes more dynamic , through your amp. It will seem as though you don’t have to put as much effort in when playing or if you put the same effort in, it will seem like you are playing with more dynamic. The guitar’s tone will change considerably ( extent will depend on the choice of CP Holy Grail or CP VT plate). EQ wise, it will be fatter (especially with frequencies from the inner strings). Single notes will now exhibit more bloom, sweetness and bell like chime, which comes from a body connected vintage style bridge. In particular chords using the 5th -2nd strings will have a much more piano like definition and quality to them. All strings will have added length of note/sustain. You can hear all these differences on the video below. The guitar used is the 2005/6 American Standard shown. It is recorded before and after conversion with exact same recording level, pre and post EQ ,pickup, vol/tone settings. The Wudtone ( Fender ) American Standard upgrades are available with either American Standard, Modern 54mm or Vintage 2 7/32 string spacing. All options for the American Standard – Wudtone CP Tremolo Conversion are now available in our online shop here.